Army SGT David Fisher died December 1, 2004, while on patrol in Baghdad, Iraq, when the Humvee he was riding in rolled over during a high-speed defensive maneuver. David graduated in 2001 from Watervliet High School in Watervliet, New York, where he had excelled on the Cannoneers football and basketball teams. He also enjoyed drawing, listening to music, playing video games and being with all his close friends. David enlisted in the Army National Guard in November 2001, after the attacks of September 11, and was based with the 42nd Infantry Rainbow Divison of the New York National Guard in Troy. He deployed in May 2004, training in Texas and California. SGT Fisher left for Kuwait in October 2004 with Delta Company, 1st Battalion, 101st Cavalry Regiment. Fisher was killed December 1, 2004, and was posthumously promoted to Sergeant on December 5. 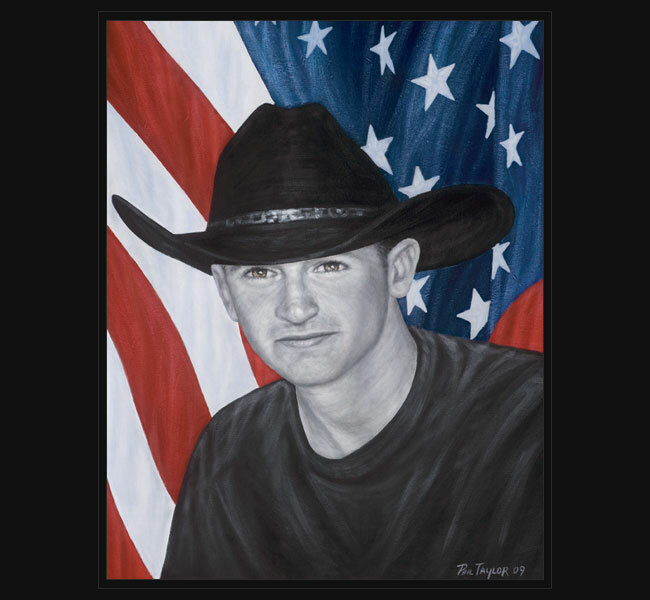 Original portrait was presented November 13, 2009, to David’s mother and family during a memorial event at the New York Army National Guard Headquarters in Albany, New York.